Storing water in hard containers seems like a no-brainer until you add up their weight and discover you're putting a pound or more of plastic on your back. Nalgene's ultralight canteen replaces all that weight with a meager 2.25 ounces—and it will hold well over 96 fluid ounces of water. Don't rush to toss out all your beloved-but-heavy water bottles, however. The Nalgene canteen is considerably less durable. I punctured mine on a sharp rock at camp and ended up having to store the canteen upside-down in my pack for the rest of the trip. The Nalgene Canteen is probably best employed as a secondary water storage system. It's particularly useful at camp, when you only want to pump and/or treat water once and have enough to last through the night and the following day. Combine the Canteen with a one-liter bottle on your hip, and you're good to go for most situations. Since the Canteen is made of plastic, we should probably at least mention the issue of water safety. 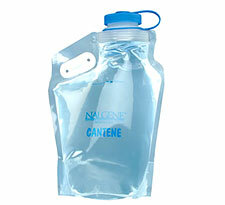 Nalgene does not disclose the exact composition of the Canteen, but it's reasonable to expect (or hope) it does not contain BPA, since it's not made of Lexan. That said, it's probably not HDPE either (at least not entirely), making this a more worrisome choice if you're concerned about possible harmful chemical exposure. I do fret about such things, but I also still occasionally use a Nalgene Canteen for 3-season camping trips. The product is simply too useful to abandon entirely, and there are no safer equivalents when it comes to this combination of low weight and large capacity.